YWCA Canberra: Welcome, feminists of Canberra, to the meeting of minds that was the YWCA She Leads Conference 2018. Welcome, feminists of Canberra, to the meeting of minds that was the YWCA She Leads Conference 2018. After our 2018 She Leads Conference, we asked a select group of women the question of how attending the event has enriched their lives. Over the next couple of weeks, we will be sharing their answers and insights with you. This week’s post comes from Kris Tay. Welcome, feminists of Canberra, to the meeting of minds that was the YWCA She Leads Conference 2018. Billed as a conference to ‘provide a holistic approach to women’s leadership’, the corporate ticket prices ($600 a pop) suggest that this event was targeted at public service and corporate coffers. And why on earth shouldn’t it be? 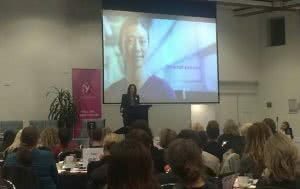 Important feminist organisations like the YWCA Canberra are overworked and underfunded, and female leaders exist outside of the women’s organisation bubble. YWCA Canberra tried to make up the difference by offering a range of scholarships, which is how I came into the picture. A young gay Asian woman? She’s a slightly inferior Penny Wong! And so I was in. The beautiful thing about being in a room of 300 women and gender diverse people is that gender tokenism is removed. On a panel of five women, no one individual is expected to talk about how they balance being a mother and a professional. Women on such a panel do not have to defy, or comply with gender roles. They can be humans, in all of their diversity. As such, these spaces are where contestability of ideas can flourish. We can be challenged to see other ways of being feminists, and to navigate a patriarchal world with the weapons we have at hand. We don’t have to repeat lowest-common-denominator forms of gender equality. In Vanessa Vanderhoek’s seminar on ‘building your personal brand’, an audience member asked “what if I don’t want to brand myself?”. I take her point. For diverse women, our branding is involuntary. Sometimes I wish I could just go the Black & Gold route and enjoy a bit of human-neutral (as Hannah Gadsby calls a white, straight, male) privilege. When I choose to be assertive (“she’s so pushy for an Asian”), collaborative (“she’s not really a leader, though.”), or even wear a god damned collared shirt (“gaaaay.”) I am unwillingly branded. We were being told in the session to lean in, but the room full of bright young things wanted to lean out. Luckily, in a feminist conference, both views are able to exist. Vanessa can continue to do her important work, guiding women through the patriarchal corridors of power, until the rest of us collude to overthrow the system. The day amplified the voices of many diverse leaders. The brilliant Dr Vanessa Lee spoke about her social justice approach to life, and collaborative leadership style. The value she placed on non-patriarchal forms of mentoring and support was clear. Dr Raji Ambikairajah said that true leadership for her was about standing down your own ego, and allowing others to shine. She noted that the leadership superpower is being in a position to listen to people, to gather, rather than pass down, information. Jamila Rizvi’s words on the “epidemic” of luckiness amongst successful women rang very true, though I wish her keynote was not billed in the program as the ‘intersectional’ discussion for the day (Jamila only discussed women as a single, homogeneous group). Nas Campanella was unapologetically and defiantly brilliant, showing in deeds and words that her success is despite, rather than in spite, of her disability (which you would think is self-evident, but the number of times I’ve been told that my way has been smoothed now that “workplaces are into diversity”…). The unexpected star of the day for me was Mary Delahunty, Head of Impact at Hesta. Aware that superannuation (even when prefixed with ‘feminist’) is not terribly engaging, she instead focused on the equality which comes with collective action, and the need for women to wedge the door open for other women. Which, stealthily, is another way of saying retirement equality requires women’s voting power, but I appreciated the subterfuge. Sadly for me, this (image above) is the only East Asian woman who made it onto the stage the whole day. And even though the speakers were wonderful, and the content thought provoking, and the fellow attendees interesting and engaging, my overwhelming feeling when leaving the YWCA Canberra She Leads conference was wondering if it was luck or, worse, design which had kept one of the most populous groups of Australian women off the stage.